The above project was also a tutorial on homemade woodgrain for the fence. If you're curious, you can check it out here. 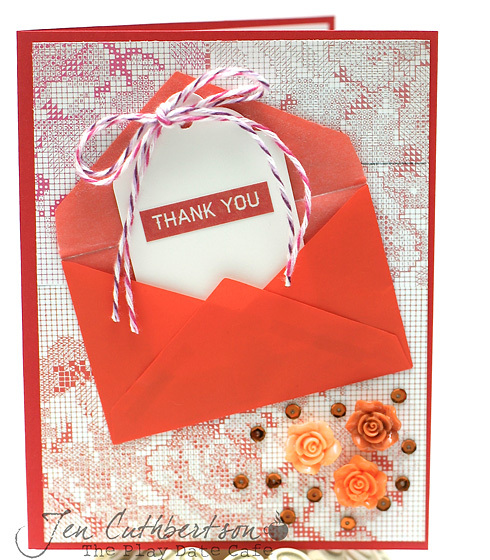 Thank you so much for visiting today and I'll see you back here tomorrow for the November kit release blog hop! It is a busy day on the blog today and there are two other posts I'll have for you later but I couldn't let the chance pass me by to say Happy Halloween! I don't really celebrate Halloween but it is such a fun little holiday to craft for, I had to make a few things! And, for the first time ever, we will be handing candy to trick-or-treaters out of our very own door which should make for a fun evening! Hello friends! 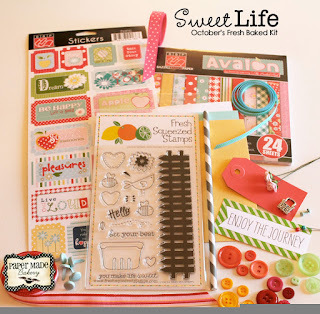 Today I have my final post for the October kit, Sweet Life, over on the Paper Made Bakery blog. I hope you can stop by and check it out! The kit is sold out but if you're interested, PMB will be releasing a brand new kit this Thursday! I'll have a new post that day and there will be a chance to win some PMB goodies! I sure hope you'll stop by! 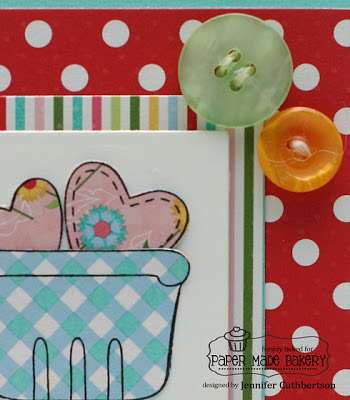 Today I have the enormous honor of being Moxie Fabber of the Week over at the Moxie Fab World blog! I about dropped over in shock when I got Cath's email and it has been really hard to keep it a secret for so long! I always love reading the interviews and getting to know all of you a bit better so I hope you have fun reading a little more about me! The amazing thing about Eichler homes are that they were designed with the "California lifestyle" in mind and flow seamlessly between indoor and outdoors. We have an atrium model (bottom photo) and the wall of windows between the house and the back yard shown in the other photos. We've been in the house a month now and are working to restore it from the country farmhouse feel the previous owners had to a more modern feel. We've loved every minute we've been in this house and are looking forward to spending a lifetime here! I just got Bright Season and Light of the World in the mail this week and couldn't wait to get them inky! When I saw the sketch for this week, I knew they'd be perfect! I've been working with Christmas papers lately and had these wonderful MME papers out so I thought the text would be a lovely background for that big lantern. I embossed the lantern with gold powder and then stamped the candle in red to coordinate with the papers. I finished the card with the leaves from the set and some little sequin "berries." I hope you have a chance to play along with us this week! There has been a change to the rules and you don't have to use WMS to play! I can't wait to see what you make! Hello friends! 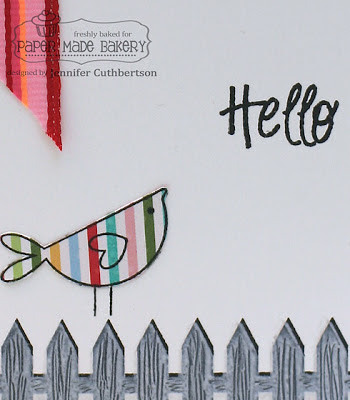 Today is release day at The Craft's Meow and the DT is having a blog hop! If you're here from Jen's blog, you're in the right spot. If not, head over to TCM to get started. What's on your wish list or what have you picked up already? I just adore these Christmas sets and am looking forward to seeing all of your creations! I used O Christmas Tree and Holiday Foundations for my card and love how well those sets go together! I stamped the star border from Foundations on a piece of white cardstock in gold ink and stamped two sentiments from the same set in the lower corner. I stamped two trees from O Christmas Tree in green ink and layered them on a piece of patterned paper. I finished the card with some gold twine and some sequins (I am having so much fun using those things lately, lol!!) Oh, before I forget, O Christmas Tree is this month's gift with $50 purchase! It really is a lot of fun to use! So how about a chance to win the entire release? All you have to do to be eligible is visit and comment on each blog before 9:00pm PDT, Saturday, October 27th. A name will be randomly selected from one of the blogs on the hop. Sounds pretty good to me!! Okay, off you go to Emily's blog for some more holiday goodness! Thanks so much for visiting today! Hello friends! 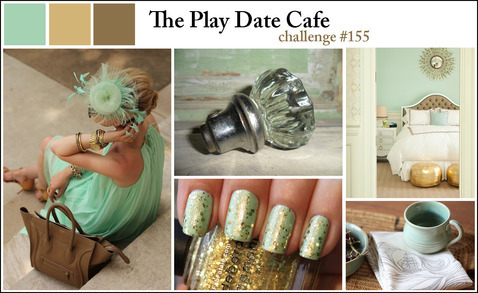 Did you get a chance to play along with The Play Date Cafe last week during the big anniversary celebration? It is so exciting to be a part of such a wonderful challenge blog!! Without further ado, let me introduce you to this week's color story - mint, leather, and gold, and our very special guest designer, Teri Anderson! This week, we're sponsored by Technique Tuesday and I had so much fun inking up the hysterical Think Beef set! I stamped the little turkey onto a label and used some gold Stickles for his feathers, mounted that onto a piece of cork paper, and used a piece of minty paper for the background. 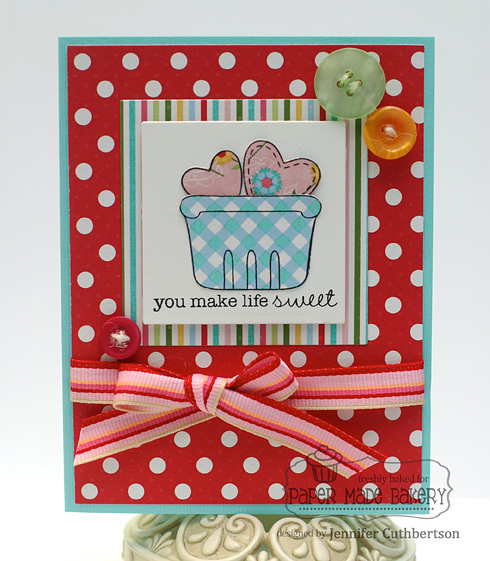 I stamped the turkey leg and the sentiment from the set and used my Tiny Attacher to attach it to the card base. This week will be the last post for our wonderful designer, Ruby, and I wish her all of the best with her new adventures away from paper crafting! I hope you've enjoyed seeing these fun stamp sets - I've had a ball looking at what the rest of the DT created with them! Don't forget to link up by next Tuesday for a chance to win some stamps of your very own! Thanks for visiting today!! Hello friends! Today is day three of The Craft's Meow October release!! 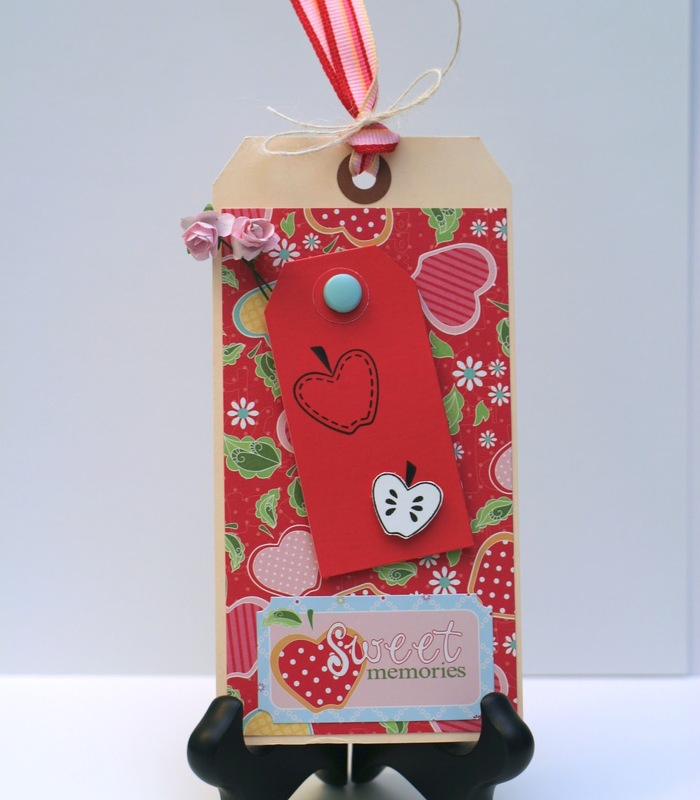 Are you having fun thinking of what you can make this holiday season using these fun stamps? I know I am! First up today is a set called O Christmas Tree designed by Amy Wanford and I am just in love with these cute Christmas trees! I started off with a white card base and then stamped the little chevron tree three times in green ink on a separate piece of white cardstock. I stamped the little trunks onto the card and layered the trees over them. I finished the card with a sentiment in red and some coordinating sequin "ornaments." Thanks so much for visiting today and don't forget to comment back on the TCM blog for a chance to win one of these two sets! I'll see you back here again tomorrow, release day (!! ), for our DT blog hop! This is my second post of the day. If you're looking for my sneak peek for Paper Made Bakery, please scroll down. Hello friends! Today is day two of the October release at The Craft's Meow! 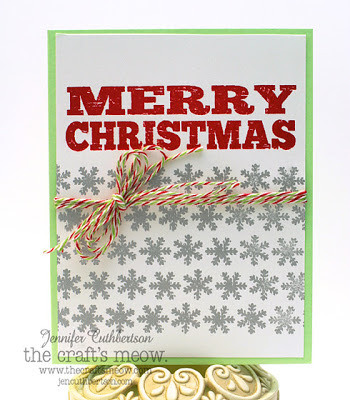 I am so excited to share two more Christmas cards with you featuring stamps from Mabelle R-O! First up is Christmas Cheer and it is filled with whimsical imagery, a wonderful frame, and 7 sentiments that are perfect for holiday projects! 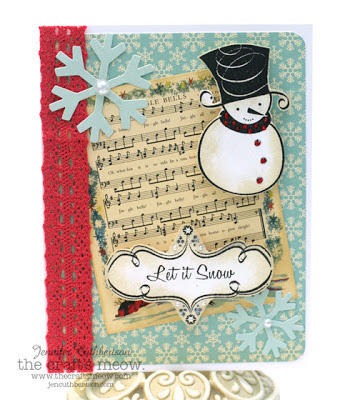 I started off with a patterned paper and little Jingle Bells sheet music from October Afternoon's Holiday Style collection. I stamped the little snowman, frame, and sentiment on white cardstock and then fussy cut them out. I finished the frame with some pearls and Stickles and added some red Stickles to the snowman's scarf and buttons. I finished the card with some trim and some snowflakes from the paper collection. This second card features Winter Fibi and Lilly and has three large images that are perfect for coloring and 5 sentiments. I chose to use the little angel and stamped her onto a piece of patterned paper. 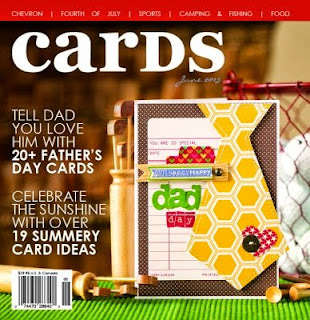 I then pieced her twice, once on cream cardstock and again on a piece of coordinating green paper for her little dress. 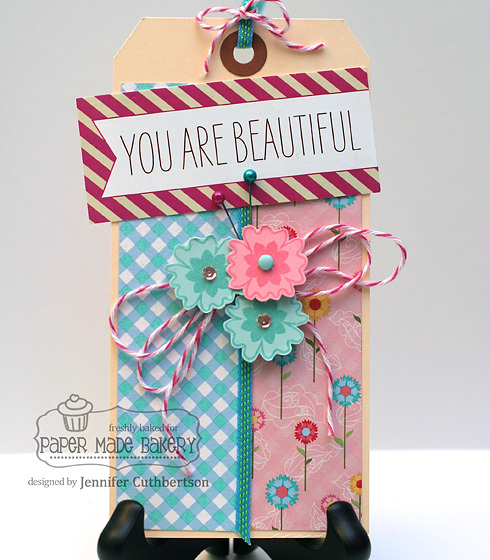 I stamped the sentiment onto a tag die cut and then finished the card with some Stickles for some shimmer. Thanks so much for visiting today and don't forget to comment back on the TCM blog for a chance to win one of these two sets! Have a great day! Thanks so much for visiting today and I can't wait to show you what PMB has in store for you in November! Hello friends! 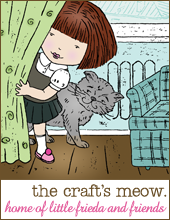 I am so excited that it is release time again at The Craft's Meow! 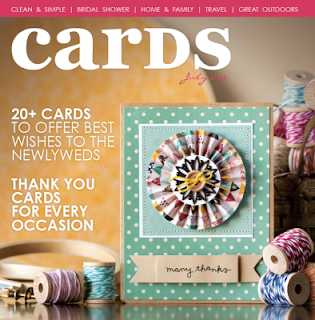 This month, there are 6 wonderful sets that are sure to help you with your holiday projects! 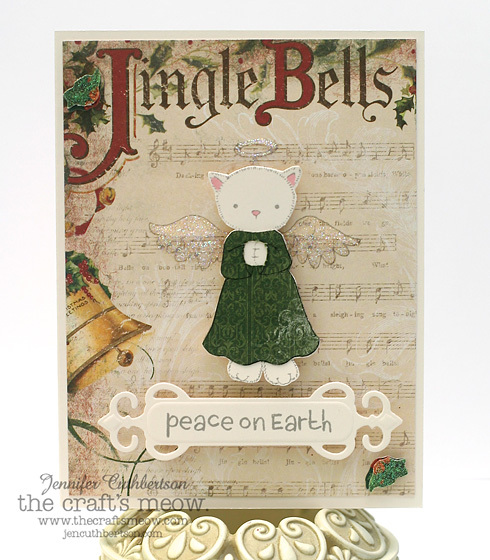 First up, I'm sharing a card that I made with Nina B's new set, Christmas Angel. She's just lovely! 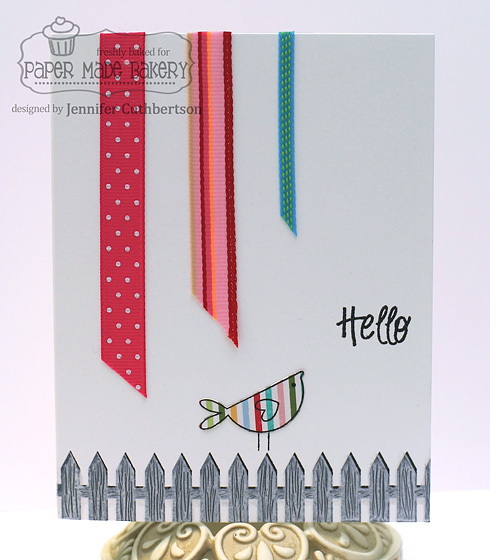 I started off with some patterned papers and stamped the verse from the set onto the background paper. I die cut two ornaments and stamped the angel torso onto the smaller ornament and layered them onto the card. I finished the card with a little bow. 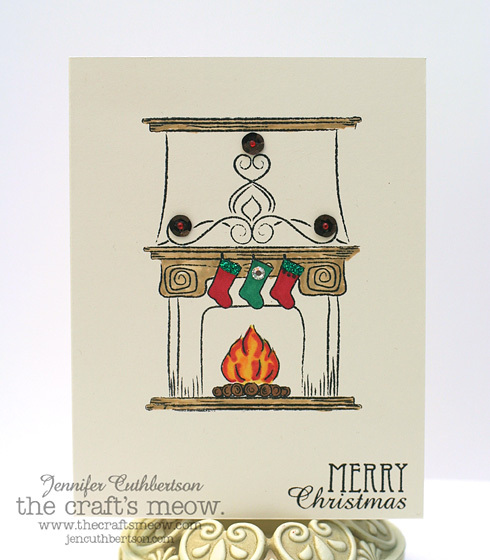 My second card features Hearth and Home by Elizabeta Kushner and is full of traditional Christmas images and phrases including this wonderful hearth! 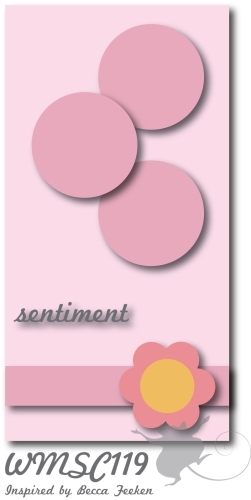 I kept this card on the simple side, stamping the hearth and the sentiment on cream cardstock using chocolate ink. I colored some elements on the hearth and added some sequins and some Stickles for some shine. I hope you're enjoying the first day of previews and don't forget to comment back on the TCM blog for a chance to win one of these sets!! Thanks for visiting today and I'll see you back here tomorrow with a couple of whimsical sets by Mabelle R-O! Hello friends! 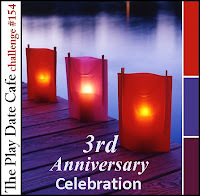 Today is a special day for The Play Date Cafe - it is their 3rd anniversary and you're in for a week of special posts and giveaways! 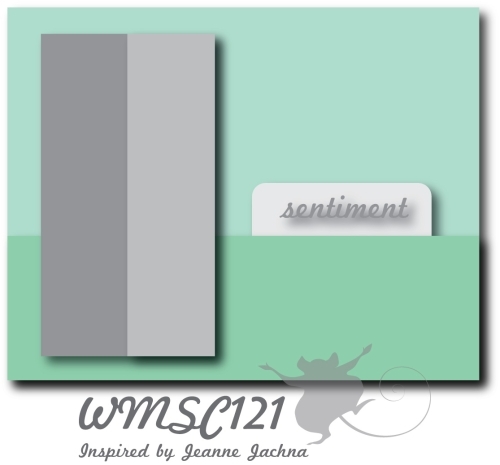 Check out the amazing color story this week. 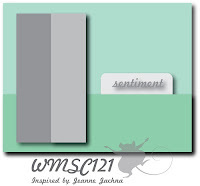 I absolutely love these colors and can't wait to see what you create with them!! As you can see with my card, I went heavy on the flame and lighter on the purples. I started off with some poppy cardstock and some Soleil patterned paper and mini envelope. I used a Soleil word sticker on a mini tag and tied it with some purple and magenta baker's twine. I was inspired by the lights in the lanterns and wanted something to evoke that shininess so I used some copper sequins and some resin flowers to finish the card. The "thank you" for my card is a big thank you to Julie for choosing me to be a part of this wonderful team! I am so excited to be a part of something so special! I sure hope you can play along and celebrate with us this week! Trick or treat, smell my feet... okay, okay, enough of that! 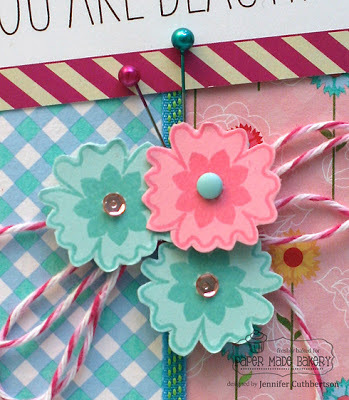 I am thrilled to be partying along with some of my favorite crafters today, Waltzingmouse Blog Party day! Woot woot!! As you may know, all of the fans of WMS get together on the 17th to celebrate the wonderful inspiration we get from Claire and her amazing stamps! This month we have a color challenge and, as you might guess from the holiday later this month, the colors are black, orange and purple! For this card, I had to dive into my new Witch Hazel collection of papers and I just adore the retro feel of the patterns in this set! I started off with the graphic orange and layered some tiny dots of black and white under the Witch's Brew label from Wanda's Pantry. 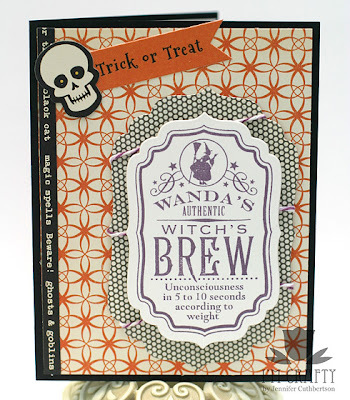 I have found this is probably my go-to set for Halloween cards, the labels are so cute and gross and I just love them! I finished the card with some embellies from the collection and some purple and white baker's twine. Thanks so much for visiting today and I'll be by a bit later to check out what you all make! Hello friends! Today is my day to post a project over at the Paper Made Bakery blog and I sure hope you'll stop by over there to check it out! :) I've been having a lot of fun with the October kit, Sweet Life, and I know you will too! I will be the first to admit that this sketch gave me fits this week! I just couldn't come up with anything until late yesterday afternoon. I decided to use my Teeny Trees set and some new papers from Simple Stories. Can you see the three circles? :) I chose a green plaid paper for the little hills and then used a couple of different trees for my little fall landscape. I used one of the treetops for a little sun and then added the sentiment. I thought the card was a little plain so I added the cloud sticker to give the sun some dimension. Important news - there has been a change to the sketch "rules" and now you can use any stamps you'd like to. WMS are not required so feel free to join up even if you don't have any! Looking forward to seeing what you all create with this sketch!! 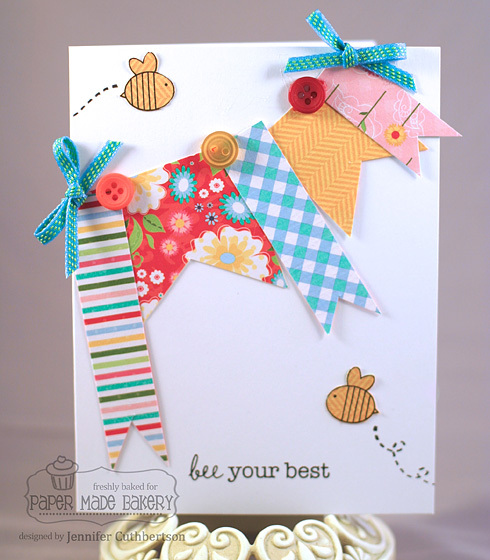 Paper Made Bakery - October Release Blog Hop! 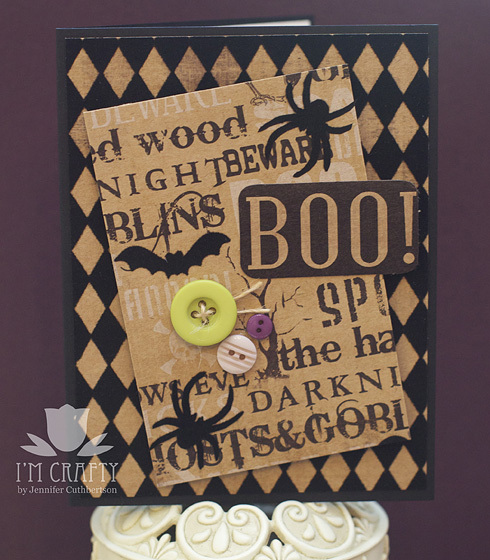 The Craft's Meow - October Sketch Challenge!